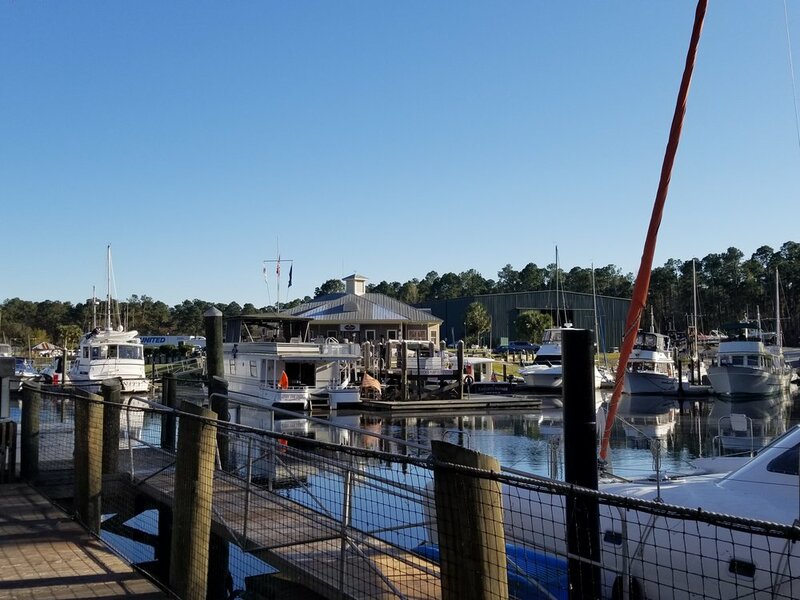 3/23 Saturday, Osprey Marina, 1238.8hrs, 66/41, sunny, N10-15 - We motored away from McClellanville shortly after first light, about an hour before high tide. The lighthouse at Cape Romain, several miles distant. With the moon still high in the sky, Grace motors north. Murphy is keeping careful watch for dolphins. The current was in our favor the rest of the day. 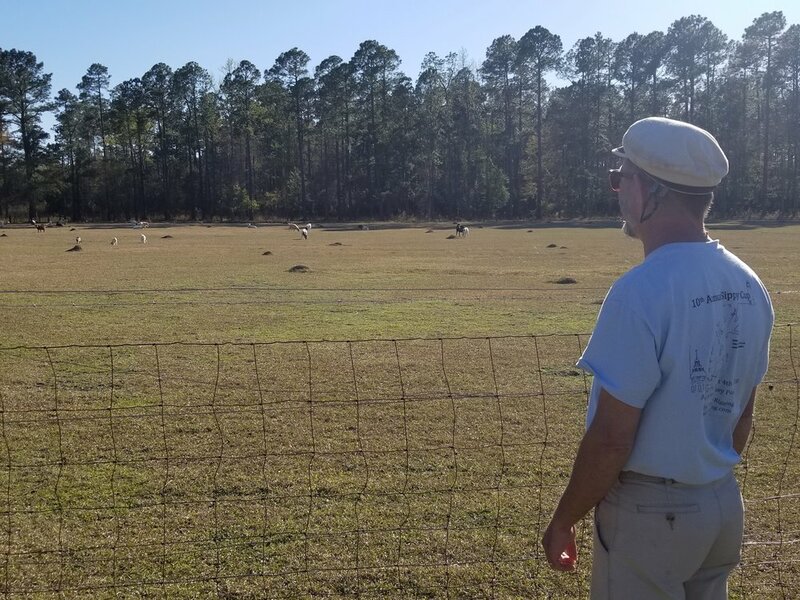 At Winyah Bay, with the wind out of the north, sailing wasn’t practical, so we continued motoring. The trees along the Waccamaw River are just coming into leaf, in bright shades of green, red, pink, and white - a very pretty sight. There were stretches, more protected from the breeze, where the sun felt warm; but overall it was a chilly day until late afternoon and we stayed bundled up. We arrived at Osprey Marina around 4pm. For those of you readers unfamiliar with the Atlantic Intracoastal Waterway, M(mile)M(marker)373 is 373 miles from Norfolk, VA, where MM1 is located. Finally, the heat of the day came on! We stripped off long underwear and wool socks, exchanging them for lightweight clothes and sandals. I checked us in and received our “goodie bag” of little gifts. 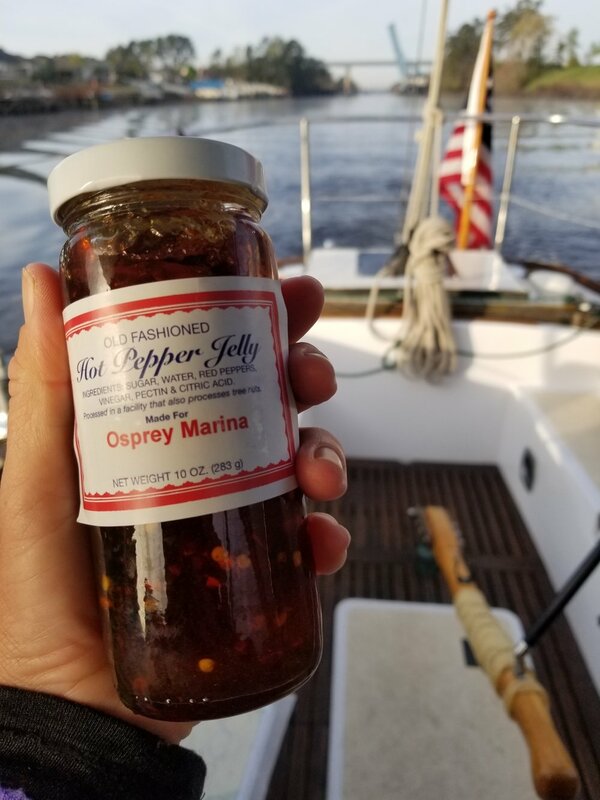 Our favorite treat is the Hot Pepper Jelly - we’d stop here just for that, though the welcoming staff and rate of $1/foot sure seal the deal. Dobbs and I walked Murphy out to visit the goats in pasture beyond the marina parking area and then strolled around the docks. I started making dinner around 6pm - a ham slice with pressure-cooked sweet potatoes and peas. Tonight, it was my turn to feel worn out. Dobbs washed the dishes while I created a blog page and then together we went for showers. I was in bed at 8:45pm. 5am comes early!